Cells are considered one of the most basic units of life, yet their structure, processes, and reproduction are intricate and complex. From plasma membranes to cell organelles to the macromolecules that are the brick and mortar of a cell, structure is an important aspect to maintain the life processes of a cell. Some of these processes, including transfer of information from DNA to RNA to protein and the control of gene expressions, are necessary functions that aid in cell reproduction. 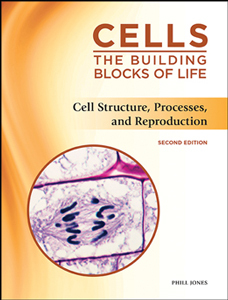 In Cell Structure, Processes, and Reproduction, Second Edition, readers will explore how the major characteristics of a cell are crucial in enabling these tiny units to carry out specialized functions in multicellular and single-celled organisms. Phill Jones earned a Ph.D. in physiology/pharmacology from the University of California, San Diego. After completing postdoctoral training at Stanford University School of Medicine, he joined the Department of Biochemistry at the University of Kentucky Medical Center as an assistant professor. There, he taught topics in molecular biology and medicine and researched aspects of gene expression. He later earned a J.D. at the University of Kentucky College of Law.